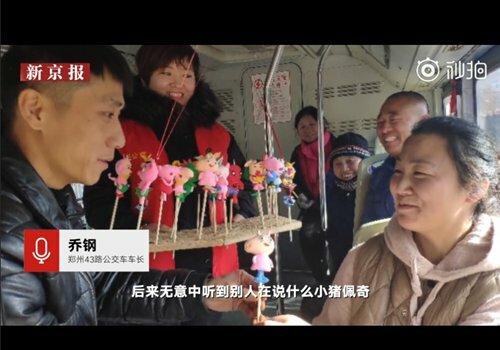 A bus ticket taker on a local bus in Central China is warming the hearts of passengers - and thousands more online - by handing out colorful cartoon figurine of Peppa Pig he makes out of dough. Qiao Gang, a ticket taker on bus No. 438 in Zhengzhou, Henan Province, is seen in a viral video expertly molding a 10-centimeter-tall figure of Peppa Pig, the British cartoon character that has become immensely popular with Chinese preschoolers. "This coming year is the Year of the Pig, which reminds me of the cartoon Peiqi," Qiao says in the video, using the Chinese name for Peppa Pig. The video shows Qiao skillfully pinching the dough to make the face of Peppa Pig, before inserting a long, thin stick and standing it up on a pegboard. "Giving my passengers Peiqi means I hope my passengers will have a 'harmonious' Spring Festival with their family numbers," said Qiao. The Chinese character pei can suggest synchronicity. An elderly woman passenger is seen in the video with a wide smile as she accepts a Peppa Pig dough figurine from Qiao. Thousands of netizens sent kudos to the warm-hearted ticket taker. "I want some like him on my hometown bus too," one netizen commented on Sina Weibo.